What do ‘square edge’ , ‘bevelled edge’ ‘tongue and groove’ 'cupping' mean? 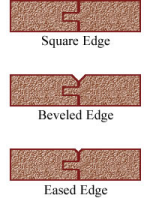 What do ‘square edge’ and ‘bevelled edge’ mean? Square edge means that the four sides of a plank or strip are square. Bevelled edge or micro bevel means that there is a slight angle on the top edge of the plank or strip. What does ‘tongue and groove’ mean? The tongue and groove system applies to the efficient installation method of snapping wood boards together. Why do small gaps appear between the boards of a hardwood floor? Almost every solid wood floor experiences some form of expansion and contraction which is directly related to the change of seasons and humidity levels. Engineered boards are by their nature inherently more stable than solid wood floors. Cupping means the edges of a board are high and its centre is lower. It is a reaction to moisture and once the cause of the moisture is established, cupping can usually be reversed. Crowning means the middle of a board is higher than the edges of the board. It is a reaction to moisture. Buckling is the most severe reaction to moisture and means that the wood floor literally pulls away from the sub floor even by millimetres. It occurs rarely and when it does is usually the result of a flood. Wood floors should last for many, many years. In order to avoid deterioration, it is advisable to control humidity and accept that some degree of expansion and contraction is inevitable given the change of seasons and temperatures. How do I look after my floor? In terms of maintenance, wood floors are easy to look after; a soft cloth dampened with a recommended cleaning product used once a week is sufficient to keep the floor clean and maintain its natural beauty and colouration.